Title text: Mathematicians give a third answer on the vertical axis, "That question is poorly defined, but we have a sub-field devoted to every plausible version of it." I think a few of these are in the wrong place. "Geology" for example. Randal seems to be defining it as "the study of Earth", of which there is one. It's better defined as the study of the features of a planetary body, we don't know how many planets exist nor do we know how many features they might have. We don't even really know all the features of Earth alone. And don't even start on where black holes fit in the "small/big" axis. Seems like theology is another one. Theologists tend to know exactly how many Gods or gods they're studying. But how big is/are the gods, in actuality? This whole chart is a masterful achievement - it trolls nearly everyone except the vi/vim/emacs guys. sotanaht wrote: I think a few of these are in the wrong place. "Geology" for example. Some of these issues depend on whether your counting species or individuals - is the planet one rock, or billions of separate rocks? Do you measure how many by class (sedimentary, metamorphic), by species (sandstone, granite, pumice), by count (a billion rocks), or by volume (~1.08 x 1012 km3)? Mycology is further debatable on the "how many are there" scale, because it's unclear how to count individuals. It matters whether you're counting the fruiting bodies of mushrooms, or the vast interconnected web of filaments underground from which they spring. It has been argued that some "individual" fungi (in the form of clonal colonies) may span thousands of acres/hectares. So by that definition the number of individuals is much smaller than by, for example, counting individual colonies of athletes' foot between your separate toes, or the individual cells in a portabella mushroom, as distinct entities. P.S. Hey sotanaht, is death backwards "birth"? Or is it what happens when Chronos and Thanatos get together and start mucking with the rules? Alternatively, there's no "N" in etymology. It's hard to believe Randall did this by mistake, after devoting at least one whole comic to those particular confusables. And there's a potential joke in wondering where etymology would be plotted. Hey someone who actually gets it! It's not meant to have a specific meaning, the idea is that writing it backwards opens it up to a wide range of conflicting meanings, which is exactly what I want from a name. What is the etymology of entymology? chrisjwmartin wrote: What is the etymology of entymology? Ant you look it up on the web instead of bugging me? cellocgw wrote: This whole chart is a masterful achievement - it trolls nearly everyone except the vi/vim/emacs guys. That's because the problem is already solved. We have nano. "Big Pharma" is very close to "Presidential History". Is it just me or is "xenobiology" a little... large? 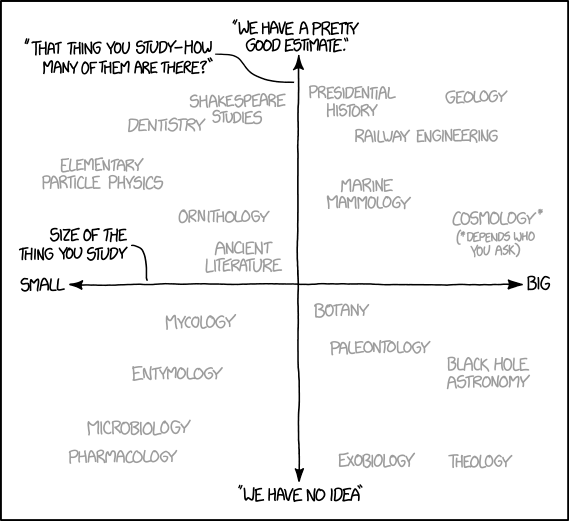 sep332 wrote: Is it just me or is "xenobiology" a little... large? Not all of these are xenobiology, but some are. And there's the old standard of gigafauna, even if you don't accept ter(r)afauna. Edit: Both of us misread/wrote exobiology as xenobiology. Same point stands, though! Is there a difference between exobiology and xenobiology? Pfhorrest wrote: where does philosophy go on this graph? Where does philosophy go on this graph? ANS: Is there even a graph? Does the graph exist? If it does, what does the graph mean? How can we determine the meaning of the graph? Does the graph have to have a meaning? Who am I to infer meaning to the graph? In fact, who am I? Do I even exist? If I do, what do I mean? Pfhorrest wrote: Is there a difference between exobiology and xenobiology? Exo- = 'outside'/' beyond', Xeno- = 'strange'/'foreign'. Conceivably there are things that are either, but not the other°, but one as a shortcut for being from beyond¹ and the other as a shortcut for being unrelated² both do currently apply by default to the unknown range of life that is not 'mere' biology. ° You could also point out that strange does not always mean foreign and foreign does not always mean strange. But let's not complicate matters. Also, xeno- also can mean "guest" or "host". Which doesn't help. ¹ Merely beyond the Earth, in some senses like Martian biology. But the whole solar-system itself is the thing beyond which exoplanets are. In less explored times, Kangaroos might have been considered exobiology. ² Martian life may not be xeno-, if found and analysed to have the same origin-story. A significantly different road-map would be expected to arise in an independent origin, and if we don't find that between us and interstellar neighbours then we probably also need to look for Progenitors in the mix, or look into a whole lot more of the possible abiotic chemical paths to see why se all developed identical chemistries. Soupspoon wrote: Also, xeno- also can mean "guest" or "host". Which doesn't help. It's like those languages that don't distinguish pairs like lend/borrow or rent/let, which makes the words almost autoantonyms. The distinction is often overlooked in careless speech, too, which suggests that there's normally enough context to figure out which roles the various parties are playing. (I remember one estate agent making a big deal about establishing whether I was interested in renting or letting). Similarly, I believe that sub and super are cognates, as if, until those Roman engineers came along, people didn't need to bother too much whether something was above or below something else. The Germanic tribes, by contrast, apparently wanted to know what (or who) was on top. Yes, we all know there's a difference between the roots. What was asked is if there's a difference between what the words refer to, which generally there isn't. orthogon wrote: Similarly, I believe that sub and super are cognates, as if, until those Roman engineers came along, people didn't need to bother too much whether something was above or below something else. The Germanic tribes, by contrast, apparently wanted to know what (or who) was on top. Except, "over" comes from the same root as "super". True, but under is a different word at least back to PIE. sonar1313 wrote: Seems like theology is another one. Theologists tend to know exactly how many Gods or gods they're studying. A lot of the ones I've heard of have a 300% margin to start with, and while they have invested themselves heavily in their predictions, there has been a distinct lack of actual counting going on. No time to read the comments right now, but has anyone pointed out Randall has misspelled and likely misplaced entypology, the study of all things printed (έντυπος)? gmalivuk wrote: What was asked is if there's a difference between what the words refer to, which generally there isn't. That'll probably change when we learn more. Also when planetary immigration and emigration eventually becomes a hot topic. Well, maybe. Exo, meaning outside, usually refers to the location, whereas xeno, meaning foreign, usually refers to the origin. So if life from Earth traveled to another planet, studying it would be exobiology but not xenobiology, whereas if alien life traveled to Earth, it would be xenobiology but not exobiology. Since neither of these things has provably even happened yet*, the distinction isn't very important. Yet. * I don't count the moon missions because life didn't attempt to stay. If they had brought along a petri dish to see how long some bacteria could survive on the Moon, that would have been exobiology. And how exactly does panspermia affect this definition? At the moment, they're both pretty theoretical disciplines, but that may change once we get around to investigating the subsurface oceans on the Jovian satellites or the methane oceans of Titan. I would think that xenobiology is life not related to life as we know it, even if it's based on the same chemicals, so long as it had an independent abiogenesis, while exobiology is life on other planets. Barring panspermia or an as-yet-undiscovered second abiogenesis event on Earth, one would expect them to pretty much always be the same thing. A difficult question: if life from Earth spreads to other planets, is the study of it then exobiology?